Comfort. Relaxation. And true outdoor style. The Jack Post Country Garden Hi-Back Glider Chair is a great way to sit back and enjoy the sun, a good book, and a tasty cold drink. 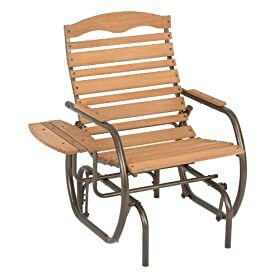 The sturdy chair is made using 21.5-inch natural hardwood slats and a 5-inch shaped top board on a powder-coated oval tube frame designed to endure weather. The slats and frame form a comfortable rounded seat you can sit comfortably in for hours. A convenient wooden tray holds drinks and snacks and can be assembled on either the left or right side of the chair. Assembly is easy with very little hardware involved. Square seat supports and seat brace offer additional strength. Measures 30 x 35 x 36.75 inches. Holds up to 250 pounds. 1-year limited warranty. Wood care guide included.